She speaks English with a strong Italian-Calabrian accent that has charmed so many followers. The way she deals with the new technology or how she argues with her son Greg that people ought to go to the “Festa della Madonna” rather than to a rock concert, beguile her followers who wait with great anticipation for her next video post. 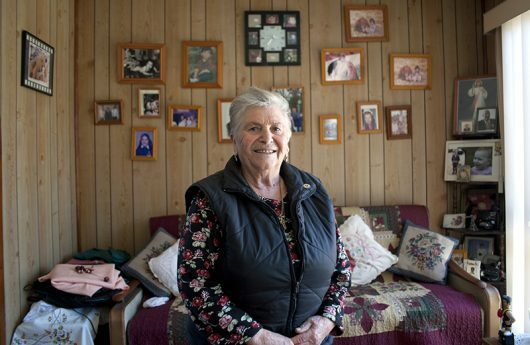 She is a star on the web and has become the Nonna of everyone. Paola, better known as Nonna Paola, was born in Calabria in a small town called Bianco. She was very young when her mum passed away. She grew up with her strict and austere father, her three brothers and her lovely Nonna who taught her to sew. When she was nineteem, after a hard childhood spent in the farm helping the family, she decided to join her brother in Australia, the land of opportunities, where she became a dressmaker. “It was love at first sight,” she tells me looking at her husband’s picture. “He sat next to me on the tram and he looked at me and said ‘I like you’. After a few months, we got married and we left for our honeymoon in a taxi that drove us to St. Kilda because we didn’t have money to go any further at that time. We had three children and the last one, Greg, drives me crazy and he makes me sick with these tatoos,” says Nonna Paola, putting her hands on her face. Nonna Paola has been a guest on numerous TV and radio shows but what she really likes doing is appearing at charity events as an ambassador to help raise funds for cancer patients.